One press of a button and you’re live. Live for everyone to see. With worldwide reach and minimal to no cost of production, social media live videos are suddenly everywhere. Easy to see why it’s caught on with individuals. But why are companies interested in this social phenomenon? Live streaming video began in 2013 when Snapchat first launched video sharing through its 24-hour stories feature. Users could record and post content up to ten seconds long for their Snapchat friends to view. 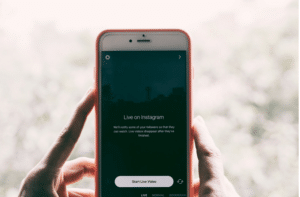 Three years later, Instagram developed its own version of 24-hour video sharing, along with a new feature, “Go Live.” With this feature, Instagram sends a notification to the screen of a user’s followers that a video is playing live. The video is accessible during its broadcast and for 24 hours afterwards. Then it’s gone. Controls allow the user to configure who can see the video and interact with the user while it’s playing. That’s the objective, to engage with immediacy. Since the launch of 24-hour video sharing and “Go Live,” more businesses have found ways to harness this dynamic medium to showcase thought leaders, brainstorm business concepts, communicate with remote personnel, and promote a sense of unity among disparate business units, among other purposes. Video posts and live video streaming has grown into the new “in” thing. The reasoning boils down pretty simply. Here’s why. Video stories and live video streaming have low to no cost of production. For example, there is no need to have a production, editing or set crew to capture company events for individuals unable to attend in person, or for audiences who may have a stake in a company event. Live streaming video amplifies a company’s ability to connect and engage with followers. Yes, followers can leave likes and comments on articles, pictures and posted video content, but with live video the connection is immediate. And viewers can leave comments and feedback for prompt attention. It’s a more intimate experience that can help build stronger relationships with stakeholders, and engender credibility if managed well. The most important aspect of live video sharing is its transparency. Since the video content is in real time, there is no editing, manipulating, fast forwarding or rewinding. It’s completely transparent and organic in contrast to conventional videos which can be manipulated through editing. It demonstrates the company is willing to engage directly and authentically with its audiences, which may engender greater trust. When live streaming first came out, I was hesitant to use it. The pressure of producing live video that allows for followers to see deeper into my life made me a little cautious. After using it a couple times, I now better understand the usefulness of the feature both personally and for the businesses I interact with. For example, live video has allowed me to see how some of my favorite clothing brands design and produce the clothes I am wearing, allowing me to become more knowledgable about the clothing industry and the products I choose to purchase. Other friends of mine who host YouTube pages find live video further connects them with their fan base, and makes them appear more “human,” versus making and editing videos online. In my current position as an intern with Susan Davis International, I have learned how live videos are shaping events in the public relations and social media fields. At SDI, we use live video streaming to help promote events and increase our audiences. We also use it to connect out-of-state reporters with local client events by providing a live-stream link, which gives them a birds-eye view without leaving their desks. SDI has also used live streaming to build audiences for clients such as the World War I Centennial Commission, Army Historical Foundation, and Museum of the Bible. For example, the centennial commemoration ceremony of the U.S. entry into World War I welcomed thousands of attendees to Kansas City. In addition to those thousands who watched in-person, the live stream video added an additional thousand guests who would not have otherwise been witness to the historic occasion. While still new, the usage of live streaming is gaining ground quickly. There are over two billion Facebook users and over 700 million Instagram users worldwide. Sharing content through live video on these platforms is an amazing technology that businesses and individuals are finding more creative uses for. Whether you’re a social connector, blogger, small business owner or worldwide corporation, live video streaming may help you stay current and aLive with your hungry audiences.